Photo: One of our faithful farmland staff checking on the tomato crop a few weeks before harvest. October 20, 2017. 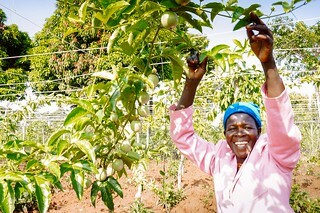 We are happy to report that we reaped a bountiful harvest of tomatoes, watermelons, bell peppers, eggplants, onions, and collard greens in August and September at our Uganda farmland— altogether over 3,000 pounds of produce were harvested during this period. This is a great blessing as these crops have been used to feed our children and native team delicious, nutritious meals. We also sold some of the crops at market, such as the collard greens which sell very well — the profits boost our program’s activities. We are also growing these crops in order to save money that would otherwise be spent purchasing the same food items at market. Thus, when all the crops reach full maturity and regular harvest times, we will save around $2,000 monthly, which is equal to about 21% of our monthly operating need. 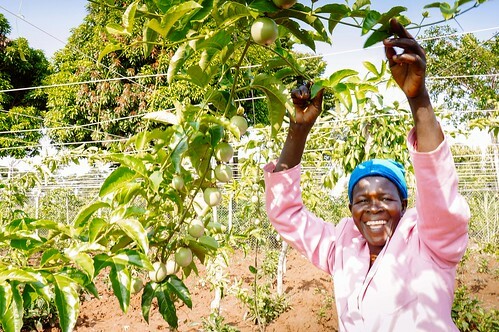 However, already, we are profiting about $1,300 monthly from the farmland, equal to about 13% of the monthly operating budget of our rural Uganda programs. This bountiful harvest was possible thanks to our hardworking native team who are manually irrigating the plants with watering cans every evening, which is one of the methods that the President of Uganda demonstrated recently when he visited our village. The president encouraged farmers to use irrigation methods instead of only relying on rainfall, especially since the rainy seasons often change and thus are unreliable. Our team is also utilizing another method the president taught them — they are attaching water bottles to certain plants for those who do not have a water source. With your support, we are seeking to raise $7,500 to purchase a piped irrigation system large enough for our farmland which will be a much more powerful and less labor-intensive irrigation method, and reliable when we face unpredictable drought seasons. In other good news, 70 of our high school students (ages 14-19) recently prepared to take their national exams which occurred earlier this week on Monday, October 16th, commissioned by the National Department of Education. To prepare for the testing, the students thoroughly studied their subjects of math, English, geography, history, commerce, physics, chemistry, biology, fine art, economics, agriculture, computer studies, and their native language of Swahili. The students also received counseling, academic guidance, and prayer from their teachers to holistically prepare them for the rigorous national exams which will prepare them to become purposeful citizens in Uganda. We are happy to share with you today the story of how one girl’s life has been changed by the high school. Komushana* came from Kamuli district, a bordering district of our Mayuge district. Komushana, now a student at our high school, has a very moving story to tell about her life. This girl is now in her third year at the high school. Before Komushana came to school in 2015, she was living deep in a rural area of Kamuli district and had no hope of joining a high school as her mother had died due to complication in childbirth when Komushana was just 3 years old. Komushana’s father is living but suffers disabilities from polio; there was no access to vaccinations in his remote rural area when he was a child. Her father, having extreme physical disabilities, was never able to gain employment of any kind. Thus Komushana suffered and struggled from extreme poverty and malnutrition as you might imagine. We came to know about Komushana during an outreach our team was doing in her district. We heard her story and, thanks to the support of our donors, we were able to offer her a scholarship so that she could continue on past standard primary education at our private boarding high school. Komushana is very humble and willing to learn and associates well with others. She likes games and sports and she plays on the school volleyball team. She is naturally bright, and has scored good grades every term. Komushana says she wants to become a lawyer. She says she loves God at heart for the miracles he has done in her life and she loves to sing in the church choir on the weekends. We are so thankful that God brought Komushana to us and for the bright light that we know she will become as a productive member of Ugandan society after graduation. Our Rapha Medical Clinic, which is housed in a facility on our main campus in the Mayuge district of southeastern Uganda, is serving our students well. They have been regularly treated for malaria as it is a common problem from mosquitos that bite in the evenings and mornings. Our medical clinic has also been caring for the local community by treating ulcers, abdominal diseases, and body rashes resulting from unhygienic sleeping conditions. Our Rapha Medical Clinic contains a 35-bed in-patient ward, several exam rooms, a pharmacy stocked with basic medicines, and offices for medical staff. We have four full-time nurses and one resident doctor, and we bring in another doctor twice a week for appointments. With your support we hope to improve the clinic by purchasing an ultrasound machine, a dental chair, more laboratory equipment, more microscopes and testing kits, a medical refrigerator to store essential laboratory supplies, mosquito nets, a solar power system, and an ambulance to help the the pregnant women living in the rural areas — it is difficult for them to get to our clinic when they are in painful labor. Area residents are grateful for the clinic, as it is the only one available to effectively serve the local town and surrounding villages. We are thankful for your faithful, generous support which makes these improvements and programs possible, blessing the lives of our students and the people in our community.